Arizona is a landlocked, desert state in the southwestern United States. Even though it is the sixth largest state in the nation, only two states have less water than Arizona's 364 square miles of water. The state's major rivers include the Colorado River, Little Colorado River, Gila River, and Bill Williams River. The state's major lakes, all formed by the construction of dams, include Lake Mead, Lake Havasu, Lake Mohave, Theodore Roosevelt Lake, San Carlos Lake, and Lake Powell. Less than 1% of the state is covered by water. What is Arizona's maritime history? Looking at Arizona's rivers and tributaries today, you might think they never were navigable and that the state has no historic shipwrecks. That thinking is incorrect, though, because many of the state's rivers and tributaries were navigable until their waters were diverted into dams for irrigation and municipal water. Historically, Arizona's rivers served as major transportation corridors for travel, settlement, commerce, mineral exploration, and development. Many different types of vessels plied Arizona's rivers including open rowed-boats, sailing craft, ferries, steam- and gasoline-powered paddle wheelers, gasoline-powered prop launches, barges, and dredges. The steamboat was used for the longest period, from the mid-1800s to early 1900s, providing an inexpensive and efficient form of transportation. In 1852, the Uncle Sam, the first known steamboat on the Colorado River, launched at the mouth of the river in the Gulf of California loaded with supplies for the military garrison at Fort Yuma. It was sunk near Fort Yuma in 1853. 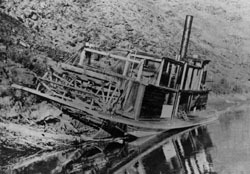 One of the last known steamboats was a wooden hulled, stern-wheel steamer named the Charles H. Spencer that was used in mining operations and abandoned in 1912 in the Colorado River. It has been documented by archeologists and is listed on the National Register of Historic Places. 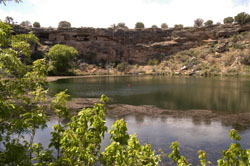 In addition to shipwrecks, Arizona has submerged roads, bridges, and ruins of prehistoric and historic sites on the bottom of her reservoirs. Who takes care of Arizona's underwater archeological sites? 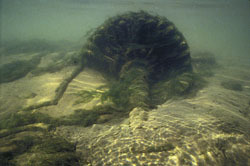 All archeological and paleontological sites on state lands belong to the state including shipwrecks. These sites are protected by law and a permit is required to even enter the site. The State Historic Preservation Office, a division of Arizona State Parks, is responsible for the identification, evaluation, and protection of Arizona's archeological resources. Institutions, organizations, and corporations organized for scientific research or land use planning may apply for a permit. Applications are submitted to the Director of the Arizona State Museum. If you happen to discover a site that is fifty years or older, this discovery must be reported to the museum. What laws are there about underwater archeology in Arizona? The Arizona Antiquities Act is codified at Arizona Revised Statutes � 41-841, et seq.